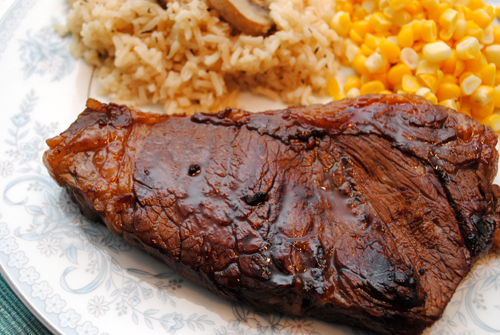 We tried two versions of Teriyaki Steak side-by-side to experiment with different marinades. We used a bottled teriyaki marinade dressed-up with 1 minced garlic clove and 1 Tbsp. minced fresh ginger. The second marinade is a homemade version of teriyaki, ingredients below, and is significantly better than the bottled marinade. Minced garlic and place in a large glass dish with a cover. Peel and mince ginger root and add to garlic. Add all remaining ingredients except the steak. Cover dish tightly and shake to combine. Add steak to marinade, cover, and shake to coat steaks with marinade. Marinate for at least 24 hours, turning steaks at least once. Grill or broil steaks to desired doneness, approximately 3 minutes on each side for medium-rare. Let steaks rest for 3 to 4 minutes before serving.